Like so many strays, Morris once had a home until his owner moved, leaving him behind to learn to fend for himself. After he was discovered, Morris became a regular on the night route where he was fed through the fence at an abandoned lumber yard. (Insert video of Morris eating before accident here). On the afternoon of July 20, 2015, Laura received a call from one of the residents that Morris was laying in the street badly injured. When Laura arrived animal control was at the scene and wanted to take Morris to be euthanized. Despite his condition he was trying to walk. 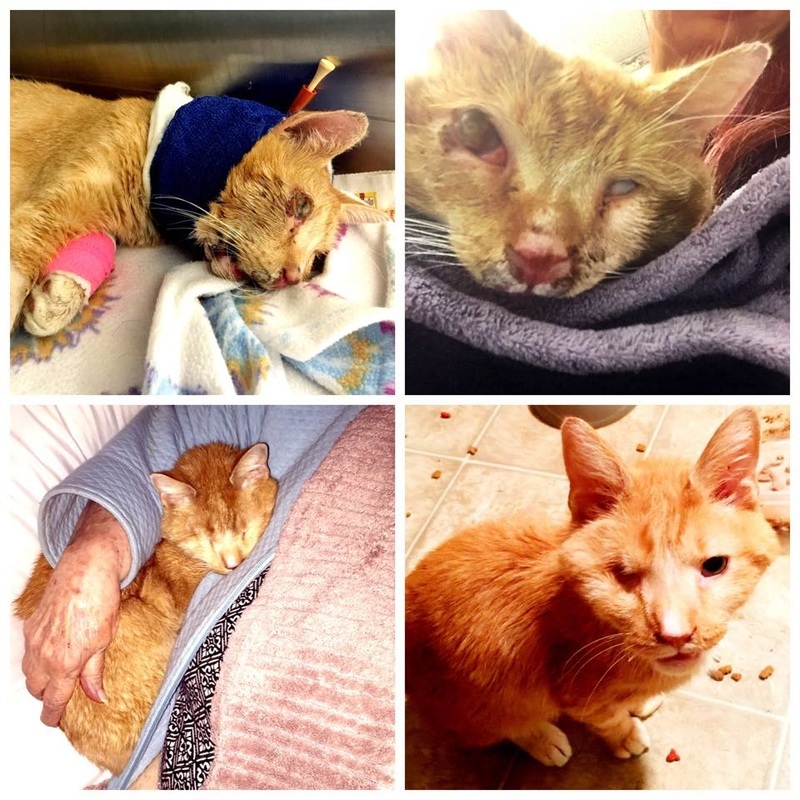 Laura refused to allow animal control to take him and rushed him to Harrison Animal Hospital where if euthanasia was the only option, it would be in a quiet space being held by someone he knows. It was later discovered that Morris’ injuries were caused by a person. He had been beaten and left for dead. Morris became the TriState Noah Mascot because he defines what the organization is about. No matter how dire the circumstances, no matter how great the effort, TriState Noah Project believes all animals deserve the chance he was given. Rescue is never about convenience. Morris’ story also demonstrates why TNR is not the only answer-they deserve a place off the streets. Morris’ costs for food and meds is roughly $140/mo (not including vet visits). You can make a donation to help with his ongoing care by clicking this link and specifying ‘for Morris’ in the notes section. Here are some photos of Morris after the accident. His body was covered in maggots which took 3 days to completely remove. 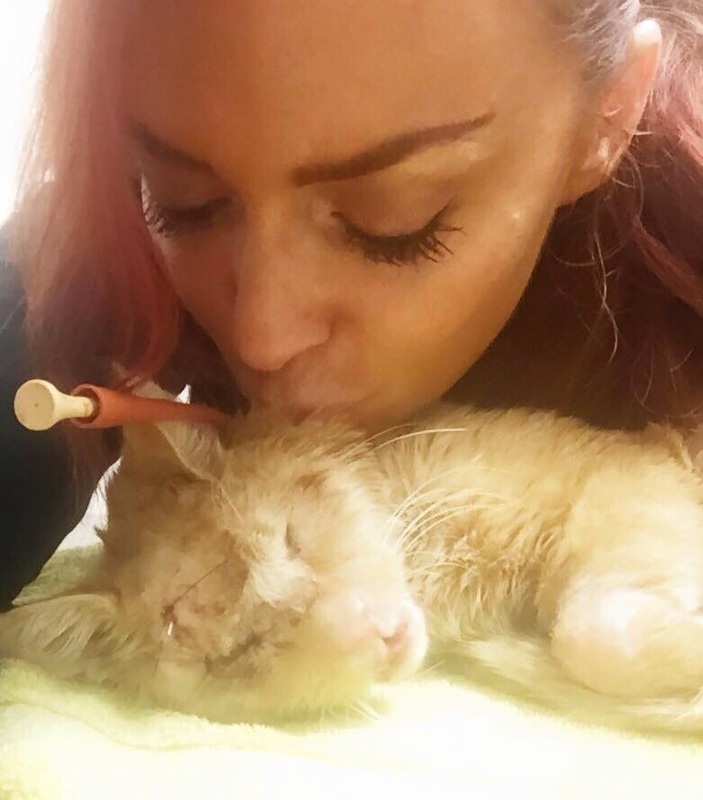 His head was crushed, his jaw fractured, his right eye had to be removed and a feeding tube had to be placed. He was unable to breathe through his nose. It was determined his injuries were days old and he managed to survive for two days on his own. Much of the staff did not think he would make it but day after day he surprised everyone. He could barely move but even in his dire condition would roll over to allow the staff to rub his belly and make biscuits in the air with his paws. He was critical for the first week and every time he underwent surgery there was an even greater chance he could not survive it. He had a total of 3 surgeries at Harrison Animal Hospital in 1.5 weeks’ time. 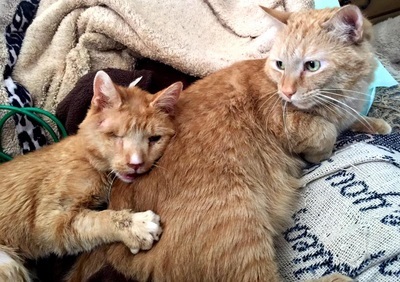 After a plea for help went up on Facebook, Morris not only received enough donations to pay for his initial surgeries, he gained supporters from as far away as Australia and Sweden. This once forgotten stray had people all over the world sending donations and well wishes. 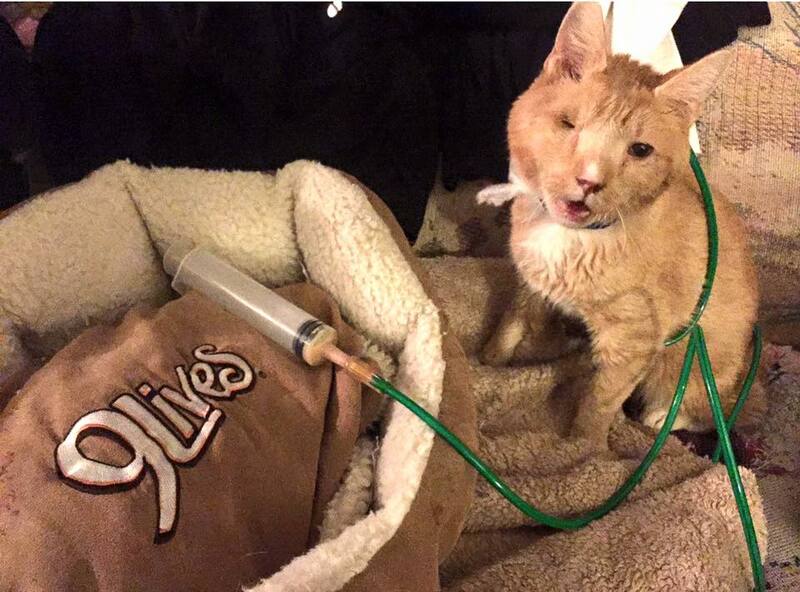 Morris was a patient at Harrison Animal Hospital for 5 weeks. Whether it was his will to live, his love of belly rubs or the bond he developed with his teddy bear, the staff grew to love him. Laura visited him everyday so he could hear a familiar voice. When Morris was not making any progress, the time came when the decision had to be made to euthanize him or continue care with a specialist. Thanks to Dr. Shalene Leddingham for making the call, Morris had his first visit at MedVet with Dr. Jennifer Geig just a week later. He had a CT scan, nasal biopsies and surgery to move his feeding tube from his esophagus to his stomach. The CT scan showed his skull had been crushed in several places. He was missing his hard palette bone and tissue had grown over that area. The scar tissue and swelling is what caused him to not be able to breathe through his nose. Dr. Geig determined he had a good quality of life and that he could live for many years with a feeding tube. There is very little chance Morris will ever eat or drink again on his own, despite his will to. He has a special diet of a/d and is tube fed 4x/day in addition to daily medications including steroids, antibiotics and anti-anxiety medicine. He will continue with follow up visits at Med Vet. Despite his injuries he has an incredible will to live and an even greater capacity for showing affection. Morris has now become a permanent member of Laura’s family. In addition to a strong bond with Laura, he is very fond of her 89yr old Grandmother and resides on her lap most of the time.